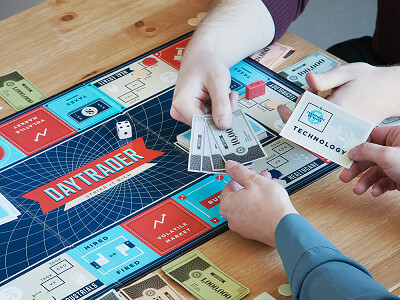 Daytrader is a fast-paced financial board game, perfect for players who want a more contemporary competition than the classic “life” inspired games that once had a “monopoly” on family game night. In Daytrader, you travel around the board, taking jobs, making money, moving up the corporate ladder, and investing your new wealth wisely. Or at least as wisely as you can in the ever-changing market, where highs and lows are determined by “volatile market” cards, and fortunes can turn in an instant. Surprisingly, this decidedly analog game was designed by a computer animator, Samir Lyons. Samir also follows the stock market, and he was surprised that there weren’t any popular board games dedicated to investing, let alone responsible investing. So, he created Daytrader as a half-cooperative, half-competitive race to retirement. And unlike similar games you’re never entirely out of the running. Even if you go bankrupt, you can always build your money back up and stay in the game. The board is sharp-looking, with a simple, deco-inspired artwork and it’s easy enough for kids as young as 10 to learn and play. Best of all, it’s a game that rewards smart and responsible play, while entertaining just about anybody. Hello Grommet! I'm Samir, the founder of Daytrader, the financial board game that brings you the thrills and chills of investing in the stock market. I'd be happy to answer any questions you have! Great concept! Will it teach me how to win at the Stock market too? @DAVID Thanks David! Daytrader is not only super fun but also carries a huge educational twist as it exposes its players to the basic concepts of money & finance. Fundamentals like: working to earn money, saving, investing (buy low, sell high), retirement and risk are all seamlessly incorporated into every game! Excellent Samir. Any plans to make this an app for phones, tablets or desktop computers? @Chris Absolutely! In fact, that was the original intent of Daytrader but to test the mechanics of the game we produced the board game first. It played so well as a board game we continued down that path first. As of now its hard to say when the digital version will be out, but please keep checking back for more updates. How many people do you need to play this game? @Joyce You can play Daytrader with as few as 2 players, which lasts around 30 mins. 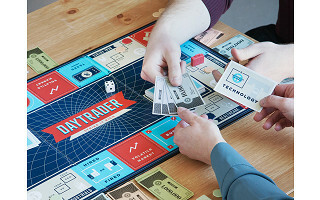 Daytrader is a fast-paced financial board game, perfect for players who want a more contemporary competition than the classic “life” inspired games that once had a “monopoly” on family game night. In Daytrader, you travel around the board, taking jobs, making money, moving up the corporate ladder, and investing your new wealth wisely. Or at least as wisely as you can in the ever-changing market, where highs and lows are determined by “volatile market” cards, and fortunes can turn in an instant. Surprisingly, this decidedly analog game was designed by a computer animator, Samir Lyons. Samir also follows the stock market, and he was surprised that there weren’t any popular board games dedicated to investing, let alone responsible investing. So, he created Daytrader as a half-cooperative, half-competitive race to retirement. And unlike similar games you’re never entirely out of the running. Even if you go bankrupt, you can always build your money back up and stay in the game.